The amount you need to save to meet your goals. Your real rate of return need to meet your goal. With all of this, we can finally begin to actually purchase investments for your portfolio. 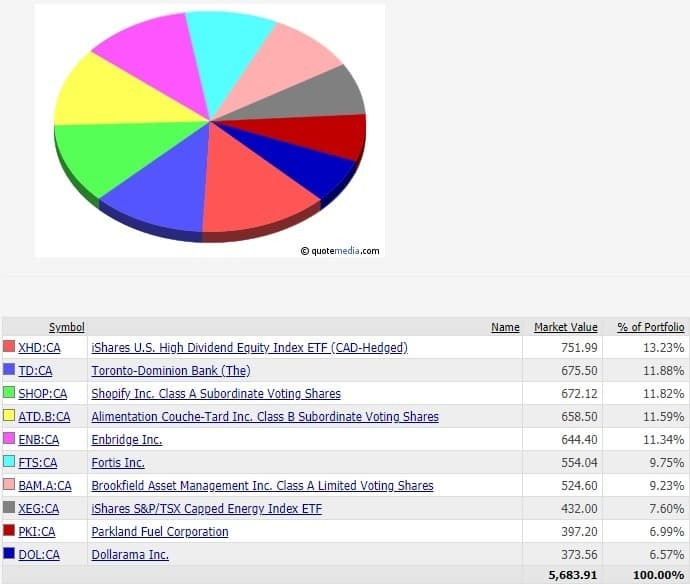 To make things easier, we’re going to use one of the 9 portfolios we have here at Stocktrades.ca and analyze my decisions I made while constructing it. Above is our Millennial Conservative portfolio here at Stocktrades.ca. These portfolios are all constructed with a baseline dollar amount of $10,000. As you can tell, this portfolio contains 57% equities at the time of purchase, and is fairly close to that right now. 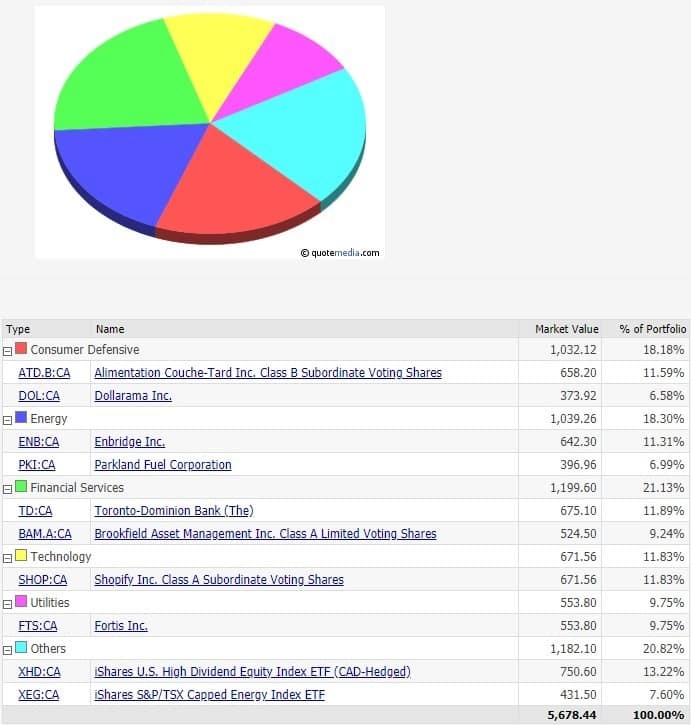 The portfolios contained at Stocktrades.ca all play off an individual investors different needs and goals, and here are the conclusions I came to when constructing this portfolio, which you should have figured out about yourself with the previous steps. As a Millennial investor, they are probably just starting out or have moderate experience in the investment world. 10 stocks is a good number for an investor like this to manage. As you can tell by the name, this particular investor has taken a conservative approach, more than likely due to their low risk tolerance. To give you an example, our Millennial Aggressive portfolio contains 80% equities, quite a difference. As a young, conservative investor, they are still looking for growth in their younger years, but also want to build a foundation of strong, stable dividend stocks to be able to withstand harsh market conditions. The stocks in this portfolio deemed growth stocks are well established Canadian companies. Although there is higher risk when investing in growth stocks, there is still a widely varying level of risk depending on what growth stocks you decide to buy. All the growth stocks in this portfolio had a minimum market cap of $5 billion. Given these rules, let’s actually dig through why I decided to purchase the stocks I did for this particular portfolio. Keep in mind, these thoughts are my opinion at the time of writing and by the time you’re reading this, economic conditions may very well have changed. The key concept to take away from all of this is the actual thought process itself and how I came to a decision. A well known ETF, XEG contains some of the biggest oil and gas giants in the country. Economists have predicted that the price of crude oil should rise in the next year, but it is fairly difficult to predict which company is going to come out ahead with so many large scale producers. Instead of picking an individual company and taking the risk of being wrong, I decide to bet on the whole sector, and purchase the ETF. Canadian banks, particularly the big 5, are among some of the safest stocks you can invest in. These stocks were able to weather the 2008 financial crisis relatively unscathed, and have proven to provide reliable, consistently increasing dividends over extended periods of time. With interest rates on the rise in both Canada and the United States, I decided to pick a bank that has exposure to both economies, ultimately landing on TD. With secure investments in both the financial, utility and REIT sector, it allowed me to take a risk on Canada’s most popular growth stock, Shopify. The only tech stock in this portfolio, Shopify is in a booming ecommerce industry that is expected to grow at a rate of 20% or more each year. Although this investment contains a fair amount of speculation considering Shopify has yet to post a profit, its growth potential is simply too rich to pass up on. Couche-Tard is Canada’s biggest retail chain. For those in Western Canada or the United States, you probably know them as Macs or Circle K. As you’ll see with another investment I’ve made in this portfolio, consumer defensive stocks tend to perform well in thriving and poor economic conditions. Acting as somewhat of a hedge against a falling economy, especially with a large chunk of my portfolio allocated to the oil and gas sector, ATD-B is a solid stock to own. Not to mention, with stores around the globe, this stock gives me international exposure without having to leave the TSX. Enbridge is strictly another foundational build in this portfolio. The company has raised dividends for 21 straight years and will probably continue to do so in the future. At the time of purchase, the company was considered somewhat undervalued and provided an exceptionally healthy dividend yield. The backbone of a large chunk of Canadian portfolios is Fortis. One of the safest stocks in the country, Fortis has provided reliable dividends for over 4 decades. In the heavily regulated utility sector, Fortis is going to be able to continue to provide consistent cash flows and ultimately return them to shareholders. As interest rates rise, utility companies tend to suffer due to higher borrowing costs, but the benefits far outweigh the risks with this dividend giant. Brookfield is a REIT play that provides a wide portfolio of assets that gives an investor broad exposure to a number of industries. With Brookfield managing assets in real estate, renewable power, private equity and infrastructure, an investor gains exposure to both stable and up and coming industries. It’s important for any investment portfolio to broaden your exposure to different economies. We’ve seen this with ATD and TD in specific industries, but XHG gives us exposure to some of the biggest companies in the United States. With holdings such as Verizon, Coca-Cola, and Pfizer, we can benefit from some of the biggest companies in the world in a booming U.S. economy. PKI is one of the strongest growth plays currently on the TSX, and its recent acquisition of SOL, the largest fuel marketer in the Caribbean, gives us exposure to over 23 countries. The fact the company has such high growth numbers and still pays a dividend of 3.43% makes this an excellent growth play. Like I said above, this portfolio is focused on lower risk growth prospects, and PKI is one of those. Another consumer defensive stock, Dollarama is a one stop shop for cheap goods. The benefit of cheap goods? People still buy them, possibly more so when the economy tanks. Dollarama is one of those stocks that can perform in any sort of economic conditions, all while providing strong growth. Once you’re done drafting a mock up version of your portfolio purchases, now is the time to go over how much of your portfolio is allocated to any specific sector. While some sectors are probably ok to have extra exposure to, such as the financial sector, it’s important you don’t get too excited and allocate a large chunk to an up and coming industry like technology. Our Millennial growth portfolio has some fairly high exposure to both the consumer defensive and financial sectors, but this aligns with our goals. These stocks tend to perform well in a variety of market or economic conditions, and this is a portfolio that should provide a moderate real rate of return, all while being able to withstand market conditions. A prime example of this is during the last quarter of 2018, while the markets were falling drastically, our Millennial Conservative portfolio was at a 5% loss at its peak. Our Millennial Aggressive portfolio was at a 20% loss. You’ve spent some time and constructed a portfolio that is well balanced, adheres to your risk tolerance and contains the right amount of equities to make you comfortable. Your job now going forward is going to be to consistently monitor and re balance your portfolio, which will be covered in our last part.